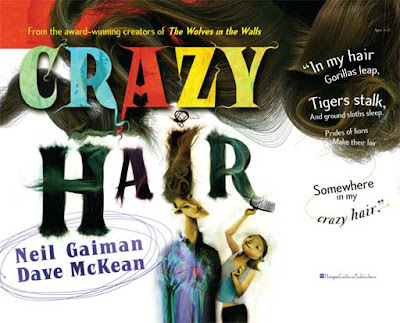 Crazy Hair is the third children’s book from the multiple-award–winning team of writer Neil Gaiman and artist Dave McKean, but the first of their efforts set to rhyming. Young Bonnie confronts a teenage boy about his misbehaving mop of hair, which he proudly proclaims has not been touched since he was two. He then regales Bonnie with the outlandish things that have taken residence over the years within his manic mane, one-upping the absurdity level with each successive claim. This is a common device used in many children’s books and one that can easily fall to lackluster repetition if not handled with ingenuity and deftness. Gaiman doesn’t disappoint. His rhymes are never stale, though the cadence remains consistent, kept fresh with McKean’s “heady” mix of real (or just realistic?) hair with ink and exuberant splashes of color. His adroit use of mixed media captures deep dark jungles, roiling oceans and cacophonous carnivals. I found myself reluctantly turning the pages, torn between my desire to linger on McKean’s beautiful art and wanting to see where Gaiman’s playful text would take the artist next. When the young man’s warnings continue to go unheeded by Bonnie’s relentless pursuit to comb his feral follicles, the reader may suspect what will follow, only to have Gaiman twist them with a sweetly surprising conclusion that is all the more satisfying in its unexpectedness. This is a delightful book that children will love and parents won’t mind reading to them over and over again. Four out of five spiders.